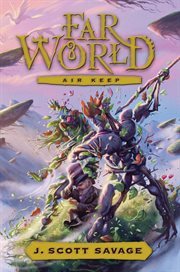 The item Air keep, J. Scott Savage, (ebook) represents a specific, individual, material embodiment of a distinct intellectual or artistic creation found in Charlotte Mecklenburg Library. It's been six months since Marcus and Kyja obtained the help of the land and water elementals, but before they can secure the help from the mysterious air elementals, the two friends must first be reunited. A task easier said than done. Master Therapass is worried that trying to pull Marcus to Farworld would put him in danger of the shadow realm, but if Marcus stays on Earth, he'll be sent back to the Philo T. Justice School for Boys instead of being able to stay on the protected grounds of the monastery. While attempting to return to Farworld, Marcus find himself in the Abyss of Time, facing four doors: the Is the Was, the Will Be, and the Never Was. What he learns in that dangerous place has the potential to change his life - and Kyja's. But does he have the courage to tell her what he learned? And in Farworld, a drought, floods, and blizzards have seized the land, hinting that perhaps there is a traitor in the elementals' midst. The Dark Circle is growing in power, and as Marcus and Kyja desperately search for the air elementals, they must first answer the question "Is there anyone we can trust?"